The header picture for this blog is a bit of my house (box 761), surrounded by trees. One of the reasons I love it so much is that it is literally and figuratively something I never thought I’d have. I met my husband when I was in my 30’s — I had already pretty much decided that I wasn’t ever going to be married. Really, I wasn’t that type. I’m not sure what type I thought I was (since I was at the time a fairly broke, marginally-employed 30-something living in a crappy rental with my two cats), but I’m pretty sure that I pictured myself, in that magical someday, living a deeply cool urban lifestyle – with a guy who read me poetry in bed and had a rakish way about him. I think I was taller and didn’t have freckles in that dream too…. However, there’s nothing that a little bit of skillfully done therapy can’t fix. One day, without realizing it, I met my man (he is a tad rakish, but there’s no naked poetry spouting going on here, that’s for sure) and if you cycle forward a few years we were buying this house in a small rural community of 2400 people. 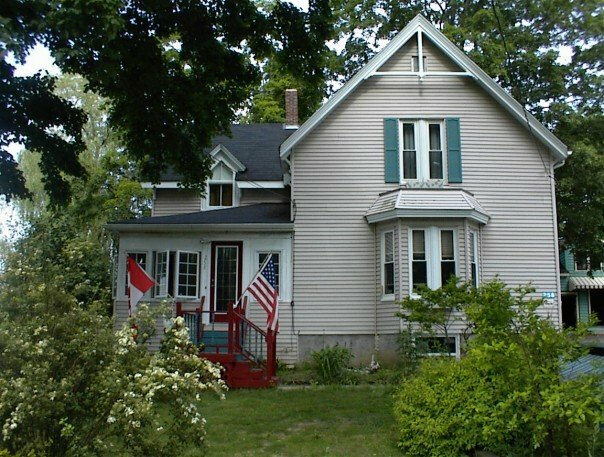 My house was built in 1899, the same year my grandpa was born. He’s no longer around, but this house is sitting pretty. Here’s my house in 1943. In 1944 they covered in the porch to make the sunroom from which I write this in 2010. It is my favorite room, but I find myself aching to have a porch. I’m working on that. If you look at the photo, you’ll see that aside from the admittedly lovely (and mourned) porch, there is a building in the back. That no longer exists. I love that if you look carefully, you can see someone sitting on the roof of that old back building (barn? woodshed?). I would imagine that’s why someone stood outside on the front yard and took the photo, right? Of those two trees in the foreground, only the one on the left still exists. It’s gorgeous, and half again as large. I think about how lovely it must have been to walk by those trees, and to step up the generous stair to the porch. I hope they had a few comfortable benches or chairs out there for people-watching, for sitting peacefully on a summer evening. I wish I could see the roof line of that porch though — I want a template for the one I am planning, eventually, to build. I can tell that this was taken before that blessed day when someone planted the lilacs that I stare at in the early summer out my window. It was definitely before my Victoriana-mad previous-to-me owner planted the silliness that is my front garden. See how nice and balanced it all is? Admittedly, it’s a black and white taken in the late fall or early spring so there’s not much around, but I can tell that the house (at this point an already mature 44 years old) wasn’t fussy and full of itself. It is what it is – a nice Victorian farmhouse. This is my house now. I do wish that I had gone out and tried to replicate the exact spot and angle of that first photo, but I’m too lazy and have used an old photo from 2003. 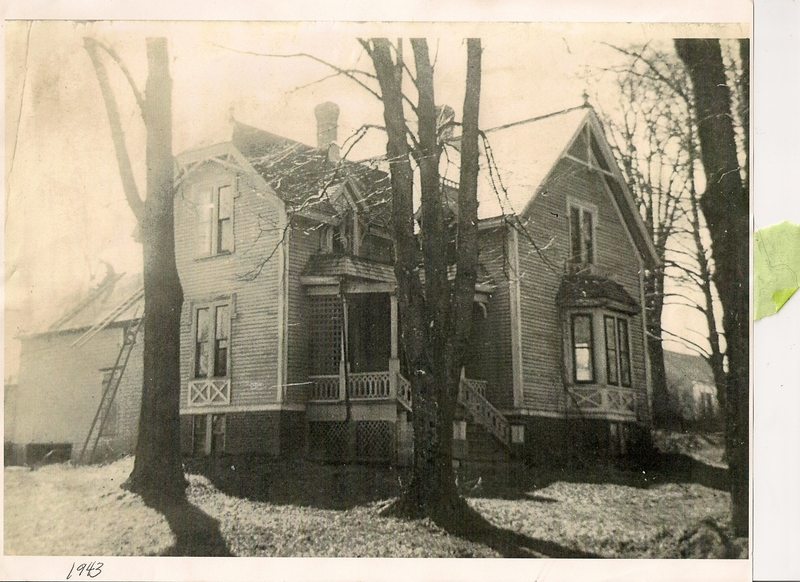 Not much really has changed, though I’m not keen on the beige siding (and we know how I feel about a porch…). I’ve always wanted a yellow house, and would love to make that happen. Funny — we built an addition onto the back of the house (pretty much where the old back building was in 1943) and when we took the siding off, the clapboard underneath was the buttteriest, yummiest, most beautiful yellow of my dreams. Go figure. Since I took this photo, someone stole my American flag, and the Canadian one broke off in a storm and I haven’t replaced either. Who steals a flag? sheesh. In this town, there are quite a few old guard who know this as the “old Creighton House” after Sam and Ruth, who lived here I dunno when. Perhaps that’s Sam up on the roof? I’ve heard stories of them — they lived here with their folks who, as folks do, died. Sam and Ruth lived here together, neither married. Sam had “shell shock” and Ruth worked at the bank down the street and was found walking, confused, in her night gown one day. I’ve heard that Ruth was a pack-rat and that the porch was full of old newspapers. I don’t know if any of these stories are true, but I do wonder if Ruth chose the wallpaper in the master bedroom closet. If it was her, she is to be commended for her good taste. To newer residents, the house is sometimes known as “the American’s House”. I didn’t help that with the aforementioned flag, but what they refer to is the brief two-year stretch when an American military officer lived here, oh, about 11 years ago now (we’ve had it for 7). Again, my flag may have contributed to the name catching on. That, and the fact that my husband was in the military as well. I have dual American/Canadian citizenship, so I guess the name is factually correct, but it’s not a particularly warm nickname…. I wonder what stories they’ll have of us, 40 or 50 years from now? I hope the future owner likes my wallpaper choices (more on those another day). I hope they like the bathroom we built. I hope they know that this was a happy house; that even if it’s beige it’s really a happy yummy yellow deep to it’s core. I hope they don’t rip down the porch I built in 2015. A little bit of therapy, some really good luck and being in the right place at the right time, and here I am. That kind of person. The kind of person who plants bushes so her grandchildren can some day play around them. A woman who can see the arc of history behind her and ahead of her, and who hopes that even if she walks downtown in her nightie someday, someone will know where to guide her home. Joan: Your blog is fantastic! You should be a writer! It made me laugh out loud at times and at other times I actually had a big old lump in my throat. While I don’t “know” you and only “know” Mark slightly better, the two you are wildly hilarious and people that I wish I lived beside (I do not walk around half naked, or at least with my blinds open I don’t)!! I too like to read but usually only do so when I go to bed at night, so it takes me a while to get through a book. I have also recently just bought the first 2 Stieg Larsson books, (I refuse to pay the cost of a hard-back book, so, I must wait for the 3rd one to come out in paperback). Thanks so much, Lynn! I’m trying to write at least a few times a week, so if you subscribe you’ll be able to know when I write something new. I have a Sony e-reader, and books are so much cheaper — I bought the first Larsson book in hard copy and then got the other two electronically for about $8 each. So much better (except for the initial outlay for the reader, I guess). I watched the movie last night (Swedish with English subtitles) and I really liked it. Very true to the book’s “feel” and kind of gritty (not safe if kids are watching with you, btw). My only problem was I didn’t like the guy who played Mickael; he just didn’t “look” right to me. Thanks again for the kind words. I wasn’t sure what I was doing, writing a blog, but your comment made me think I’m on the right track.